Pirates of Pangaea: First Teaser Poster! 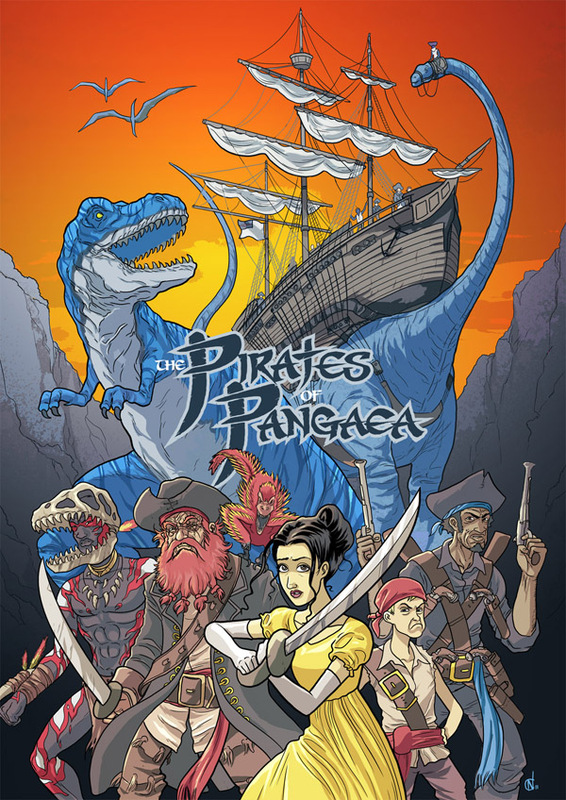 I am delighted to be able to share with you this first bit of previewy teasery postery art from Dan Hartwell and I's upcoming swashbuckling dinosaurical magnum opus, The Pirates of Pangaea. Coming in The Phoenix Comic, a brand new story comic for children launching in January 2012! Will blog lots more about this as we get nearer the time. And there'll be another teaser image coming soon which I'm really excited about - something I was in fact so pleased with that I think it joins page 62 of MoBot High in the rather exclusive 'Things I Have Drawn That I'm Actually Reasonably Happy With' club. Pirates! And Dinosaurs! Come on. 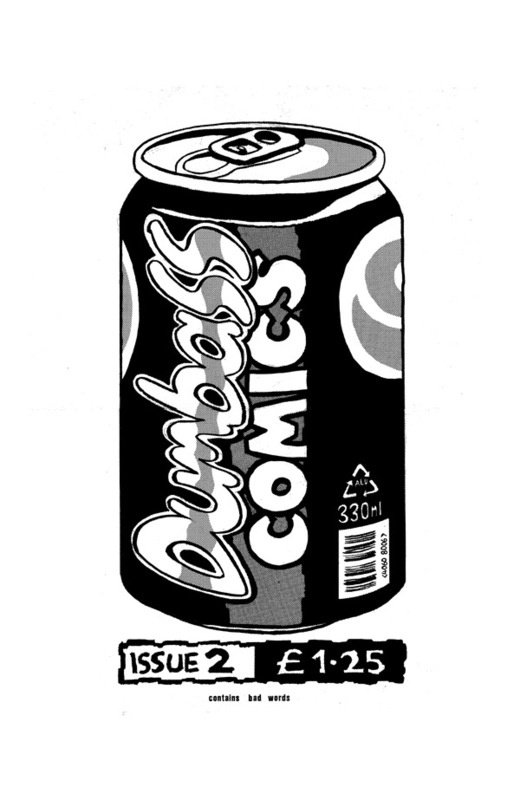 A while back I answered a few interview questions for Matt Badham for an article about small press comics that, for whatever reason, ended up never being used. Probably because I was SO BORING. Anyway, I thought I might as well stick it up here, in case anyone is interested in hearing my misty-eyed reminiscences of the UK small press comics scene in the 1990s. It is a fun excuse to post a bit of old Dumbass Comics and Bulldog art, at least. Nostalgia-sense: tingling! How did you get into small press comics? I'd been drawing comics since I could draw, pretty much. When I was 6 or 7 my brother and I would make our own little handmade comics in the style of the Beano and Oink and present them to our parents for approval. When I got a bit older I started making comics at school, weird nonsense narratives drawn in spare exercise books, the plots based on jokes and suggestions from my friends as I went along. Eventually, I'd say about age 14, I discovered the magic of photocopiers and took the bold step into making comics with a print run higher than one. Slightly higher, at least. I think I discovered the wider world of small press comics through a little piece of comics history that may not be particularly well known or remembered these days but which was enormously personally influential for me and, I'd suspect, for many of my friends - the 'Announcements' section of the classified ads in the back of Comics International. That tiny little column on grainy newsprint stuck at the back of the magazine was kind of my window out into a world where people created their own comics and via the magic of cheque, postal order and Self-Addressed Envelope, actually sent them to other people to read. Why did you get into small press comics? Like I say, there's really no point in my life past the age of about 5 where I wasn't making comics one way or another, and I guess a big part of the appeal was making people laugh, giving people enjoyment, and getting some kind of response back. 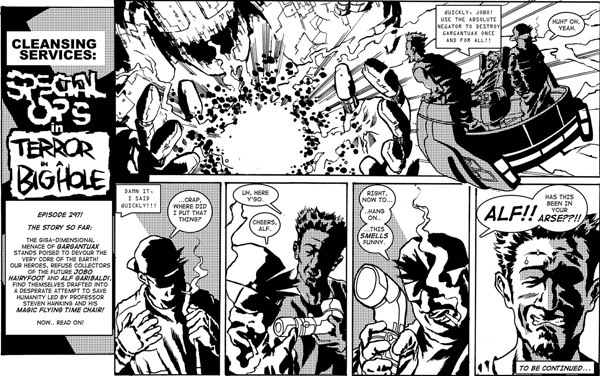 Once I discovered that such things as small press comics existed - that I could draw something and have it read by people outside my immediate family and my class at school - it seemed incredibly exciting, and there was no stopping me really. 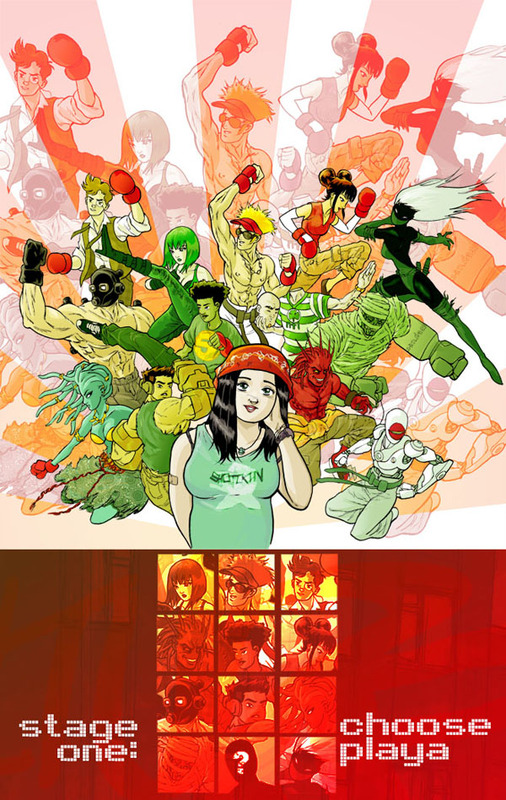 What was the best part of being part of the small press comics ‘scene’? I think the best thing for me was the support and encouragement - and helpful criticism - from other artists, writers and creative types. When I was first making small press comics, in the early 1990s, I really didn't know anybody in real life who read comics. (Apart from my little brother, and he just stole mine). Given that this was back before we all had that there new-fangled internet, the small press was really the only way I had of communicating with other people who were into comics - through letters and photocopied comics traded via the Comics International small-ads column. Getting told "that's great, you can draw" by someone who wasn't my Mum, and working with people of shared sensibilities to make comics together really was a profoundly wonderful experience. I would hope things are much healthier these days. Making your own comics seems to be much more of a cool thing to do, so hopefully people nowadays are above such petty squabbles. Or if they're not, at least I'm sufficiently out of touch to not hear about it. 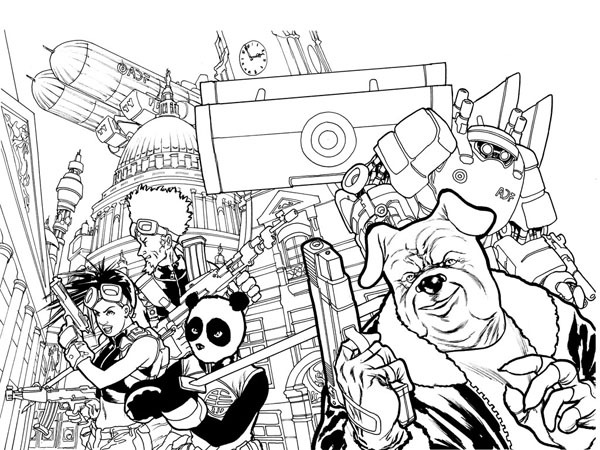 What do you think the thriving nature of the scene says about the state of the comics industry in this country? Getting a break in the UK comics industry can be pretty tough - I'm trying not to sound negative, but I think that's fair to say. What opportunities there are tend to be working on licensed / established properties; there simply aren't many publishers providing a platform for writers and artists - particularly new or unpublished writers and artists - to just come up with their own ideas and stories and see what happens. 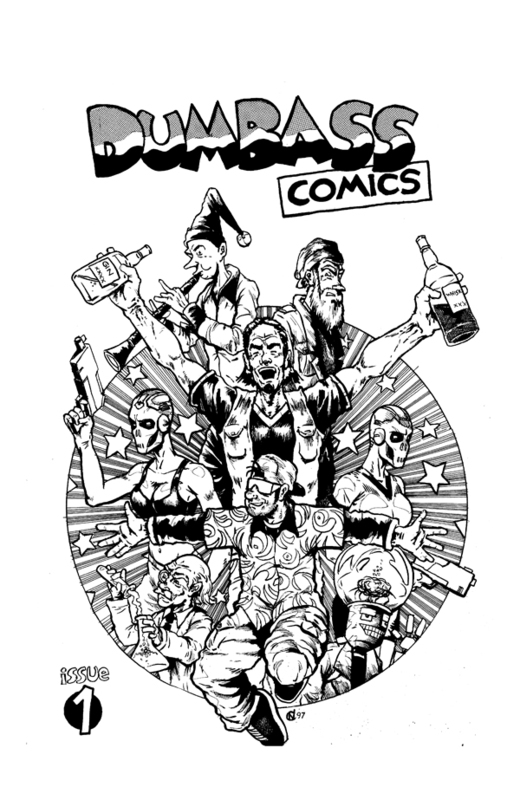 Which is a shame, as that of course is the funnest part of the whole 'creating comics' thing. As such, I think it's entirely understandable, appropriate and awesome that people just go ahead and publish their work themselves. It's how you learn your craft, it's how you find your style, and it's how you connect with people who share your sensibilities. And it is fun. That, too. I think that increasingly it's going to be an appealing option for people to just stay in the small press, but to actually make a living doing so - or to go back and forth between professional work and their own small press stuff. When I was first making small press comics, like I say, they were photocopied and sent out in the mail, and I'd literally sell like 50 copies if I was lucky. I recently did a series of drawings for fun on my blog, and for whatever reason they just got picked up and linked to all over the internet like crazy, and at the height of it I was getting hundreds of thousands of readers every day - many of whom were genuinely eager to buy stuff from me, and seemed confused that I didn't really have anything to sell them. The fact that the potential audience is so much bigger these days, and so much esier to connect to, is to me an absolutely marvelous thing, and creates all sorts of interesting possibilities for creatively-minded people. Do you think that the body of work you produced for the small press helped you to get professionally published? Absolutely, yes. When I was doing small-press stuff I was always dreaming on some level of being a professional artist and drawing comics for a living, even though for a long time it seemed like an idle daydream rather than something that was actually remotely possible or achievable. 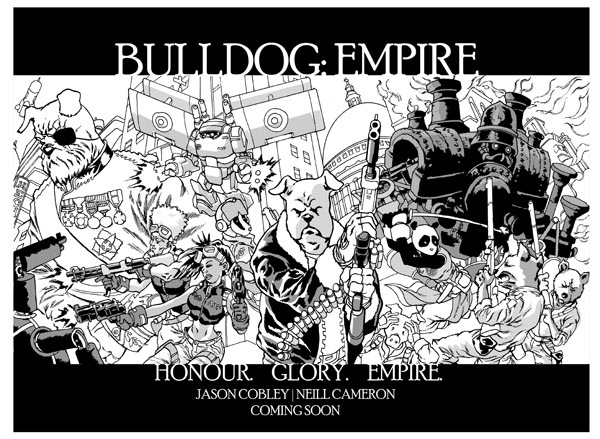 It was when I had a mild quarter-life crisis, decided to get serious about comics and knuckled down to produce a couple of decent-sized works (the sci-fi miniseries Bulldog: Empire with Jason Cobley and my own martial arts rom-com webcomic Thumpculture) that things started to happen, and my first professional works can be traced pretty directly to coming out of those projects. If you do good work, and put it out there - well, it can't hurt, it can only help. 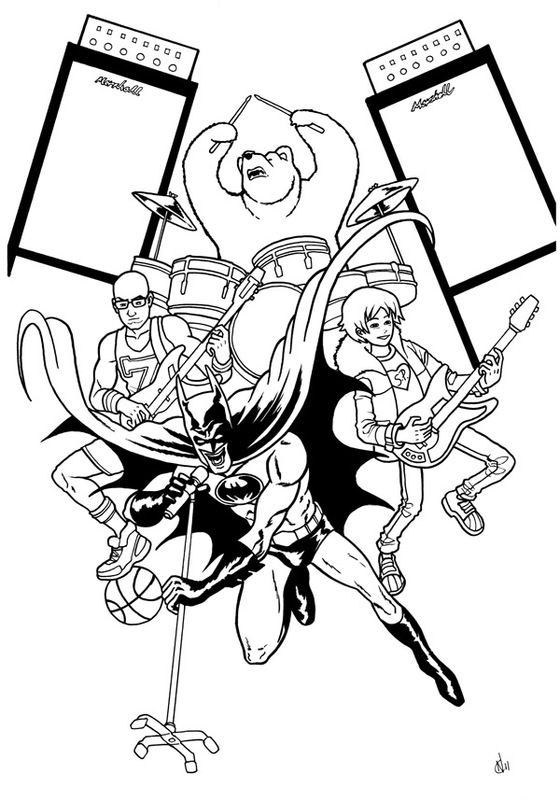 What if Batman, Scott Pilgrim, a basketball player and a bear started a band? THIS IS WHAT. This is a commission I drew a little while ago - see, the "draw whatever you want" offer wasn't just talk! Huge thanks to Tim Sismey who commissioned this and gave me the opportunity to draw such a randomly awesome thing, and for giving me permission to repost it here. And a belated happy birthday to Tim's friend Chris, the b-ballin' recipient/star of this piece himself. I think I might take the commission offer down from my shop soon, as I've got a ton of work on at the moment and am pretty much at full capacity. Aargh, but on the other hand, I do like getting paid money to draw stupid awesome things. Tell you what, I'll leave it up there for another week or two, and then that's that. Get in quick if you want one! 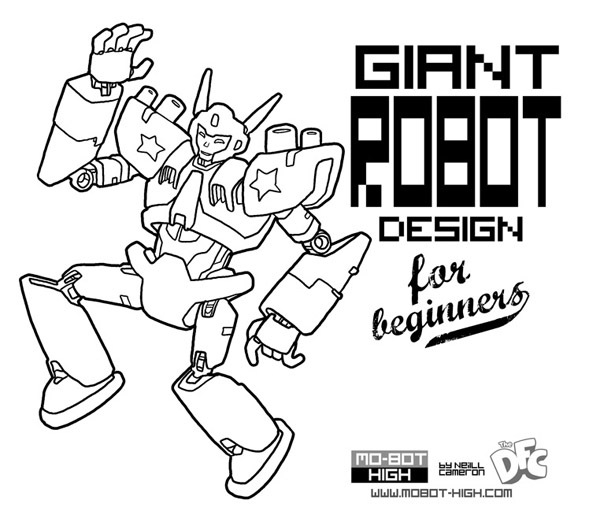 The summer holidays are looming, and what better way to distract and subdue your children than by introducing them to the fascinating and rewarding art of GIANT ROBOT DESIGN? Simply head over to mobot-high.com where you will find, under the 'Extras' section, a handy worksheet containing several instructive and edifying lessons I have put together ON THIS VERY SUBJECT! 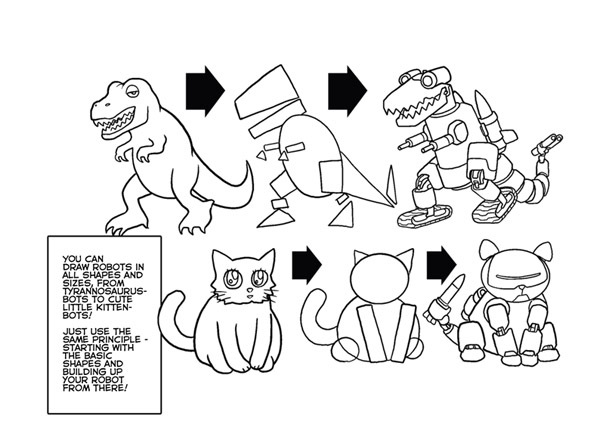 You can read them online or download PDF versions to print off and get drawing on! And be sure to check out the Extras section while you're there for a bunch of other fun stuff - more how-to sheets, behind-the-scenes Mo-bot stuff, downloadable CARDBOARD MO-BOT KITS and all manner of such fun things! The long, hot summer months will fly by, being spent exactly as they should: INSIDE, DRAWING ROBOTS. I put these together for some recent workshop events (more info on events here), and thought I'd share them with the world. Please, tell your friends and any children of your acquaintance - anyone who likes giant robots, really. 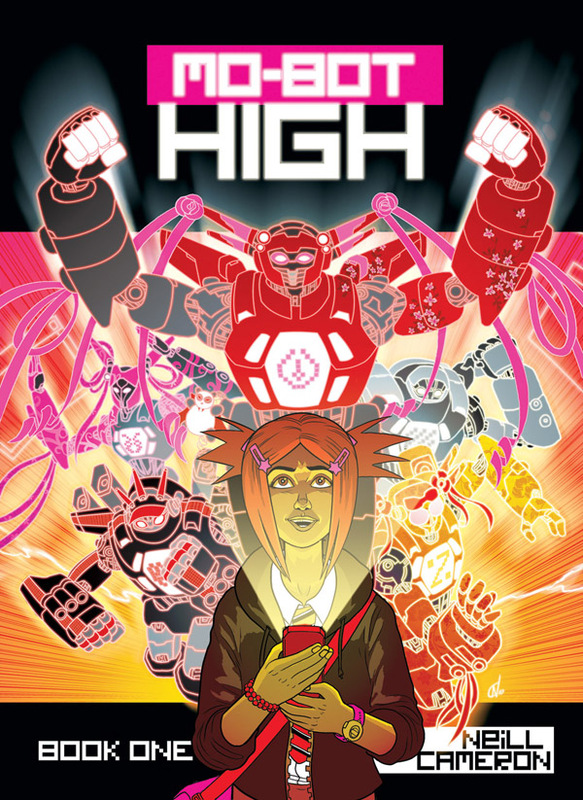 And hey, if they like giant robots - why not buy them a copy of Mo-Bot High? It has such things in, you know.